We’ve learned a great deal about summer setback (Allington, et. al., 2010) and we know children who don’t read during the almost-three-month vacation will lose ground. We also know from the Scholastic Kids & Family Reading Report that 80% of kids ages 6–17 and 96% of parents agree that reading books during the summer helps kids during the school year. So why aren’t kids reading during the summer? For some it may be limited access to text (Neuman & Celano, 2001), others may perceive the task as too hard, and for others it may be that a reading routine is not established. Some communities have tried to solve the first challenge, access to text, by implementing summer book floods, making sure kids have something to read June, July, and August. While this helps, if reading is perceived as hard, putting books in children’s hands may not be an effective solution. Further, summer often lacks structure, and if there is no routine around reading, it may get overlooked for other activities. Obviously the challenges around summer reading are like peeling an onion. The many layers make supporting children in the summer complex and may leave teachers feeling overwhelmed and unsure of how to proceed. Focusing on all three components allowed a shift in our thinking about summer reading. In other words, instead of thinking about summer as a separate time, we thought about is as an extension of the school year. So what are the implications for children across the country? To begin, teachers can implement an independent reading time. Independent reading contributes to reading growth, and for children who are having difficulty, reading volumes of text is essential to accelerated progress. Further, independent reading should be an everyday routine. During this time, teachers can assist children in selecting texts that support them as readers, and can also talk with their students about how to do this on their own. These conversations are critical, and without them many children will select texts that are too difficult, which can contribute to feelings of frustration. Healthy classroom libraries assist these efforts. A healthy library is like a healthy diet, it should include variety: a variety of genres, text types, and levels that will ensure children select the just-right text. When children have materials they can and want to read, the next step is intentionally creating time to read outside of school, which extends the idea of everyday routine. Reading routines start in the classroom, should become part of children’s nightly expectations during the school year, and are ultimately integrated into the summer. 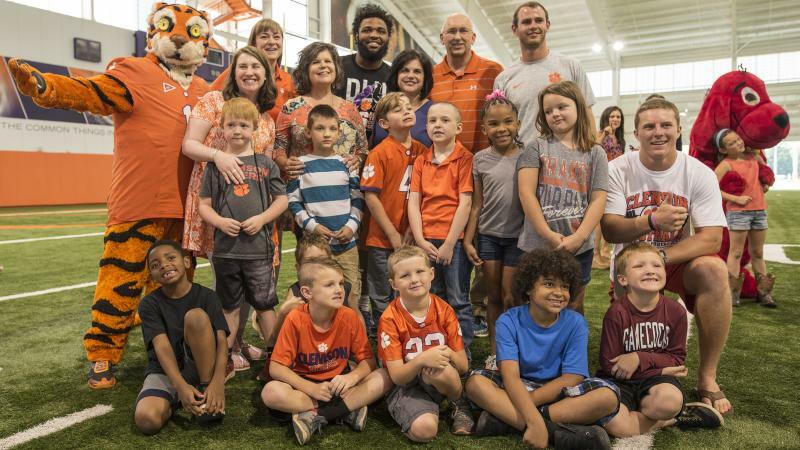 Last week, college football players from the 2016 National Championship team read to some of the children participating in the Tigers Read initiative. The players shared how they train all year long preparing for the football season. They develop routines and stick with them even when they are on a break; exercising and eating right. The children also developed routines and were encouraged by the players to stick with them and keep reading every day. Allington, R. L., McGill-Franzen, A., Camilli, G., Williams, L., Graff, J., Zeig, J., Zmach, C., & Nowak, R. (2010). Addressing summer reading setback among economically disadvantaged elementary students. Reading Psychology, 31(5), 411-427.